I've been dreaming to create a Xmas book of ribbon sculptures for quite a while. 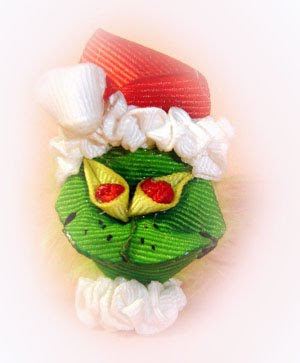 I love Xmas and love to create those cute Xmas figures and ornaments. 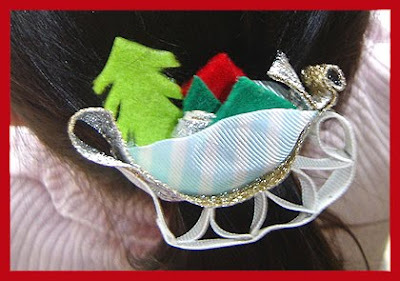 Last year, Hair Bows Wonderworld released four sets of instructions for Xmas and I've just added a new set to my portfolio. 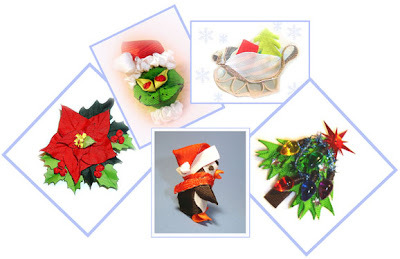 Inexpensively available in my Etsy shop are instructions to make a Penguin, a Santa Sleigh, a Fancy Xmas tree , a Poinsettia flower with Holly leaves and Berries, and a Green Xmas Monster (all 3D - I love 3D). I tried to create my tutorials as simple as possible which require only simple tools and materials that are easy to find so anyone can do it. In fact, to make my ribbon sculptures you just need to have scissors, needle and thread, hot glue and hot glue gun, ribbon, felt (sheet), a pencil and a lighter. No sewing machine, wood burner etc required. 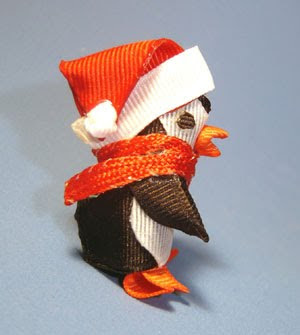 Last year I made a bunch of penguins and poinsettias for my friend so she could hang them on her small tree. It looked so pretty with those handmade ornaments. You can do it, too! DIY! Celebrate and decorate your Xmas in Style! I hope I can complete my Xmas collection this year. Five sets of instructions mentioned above are now available in my Etsy shop and soon to come are Snowman, Gingerbread Pretties, Rudolf the Reindeer and Cheerful Santa. So if you're feeling DIY this Xmas, it's worth it to take a peek in my Etsy store, you won't be disappointed! 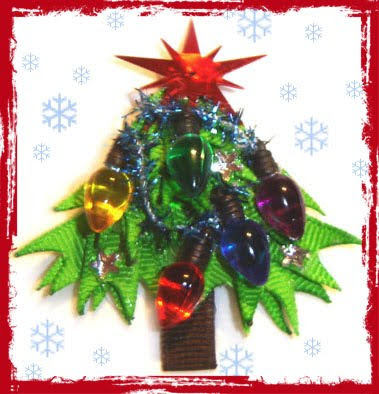 Happy Holiday everyone and Viva Crafting :-)!